A short while ago, I went hiking in Ras Al Khaimah with a few friends and I was charged with snack duty. They know me well enough to know “snacks” really equals an indulgent meal with a touch of healthy added in! I was trying to think of the perfect on-the-go lunch that would keep us fuelled throughout the hike, easy to carry and eat, but more importantly, something that made that half-way point all the more enjoyable. Despite being a relatively average 4-hour hike, I’ll always take any excuse for good grub! I think the key to any really good sandwich is a) copious amounts of filling and b) your sauces. It’s got to be bursting with squishiness and overflowing with flavour! Mission accomplished here, that’s for sure. We have two types of pesto – not necessary of course – but recommended. Chilli pesto on the bottom and basil pesto on the top. 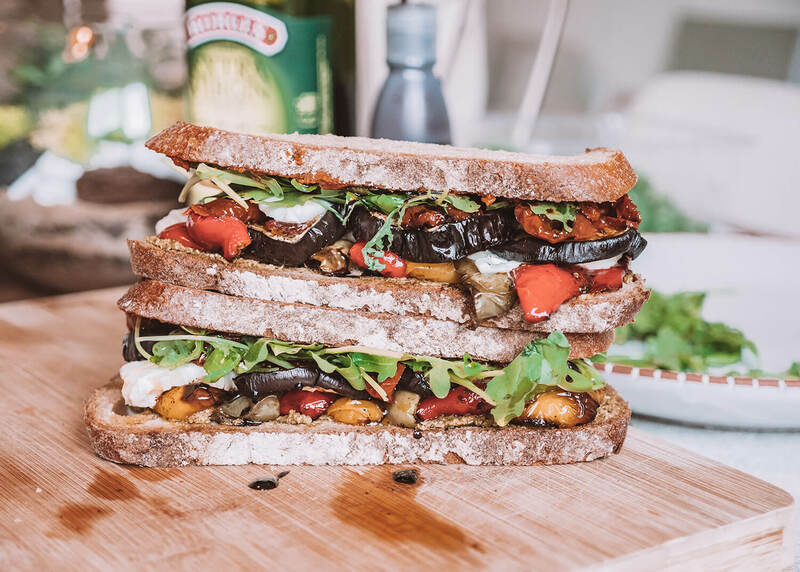 The roasted vegetable filling consists of mixed peppers, aubergine and sun-dried tomatoes and it’s topped off with fresh peppery rocket and creamy mozzarella cheese. Slice the Aubergine into 2cm discs and cut the peppers lengthways into roughly 8ths. 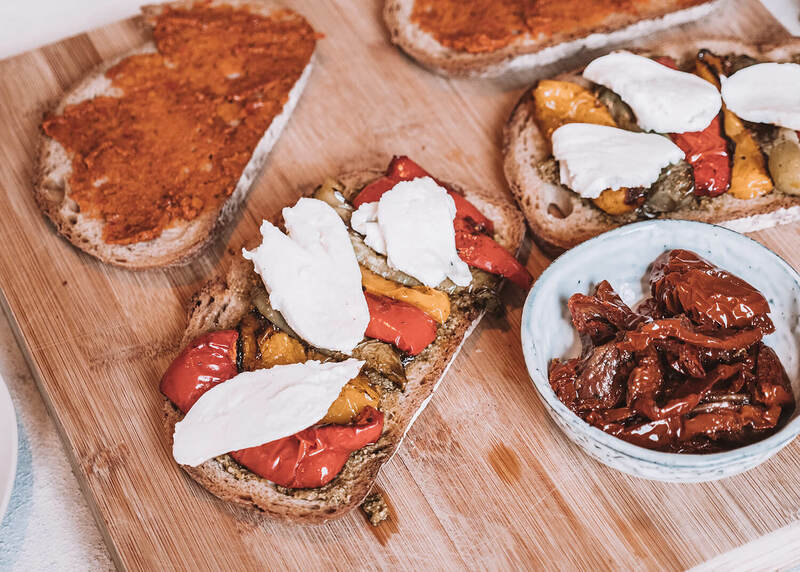 Place the vegetables on a baking tray lined with baking parchment and drizzle over olive oil, a sprinkle of smoked paprika and season with salt and pepper. Roast for 15 minutes, then flip the veg and roast for a further 5-10 until soft and starting to crisp. Start to layer the sandwiches! Smear the pesto on the bottom and tops of the bread (one with basil pesto, the other with chilli pesto). 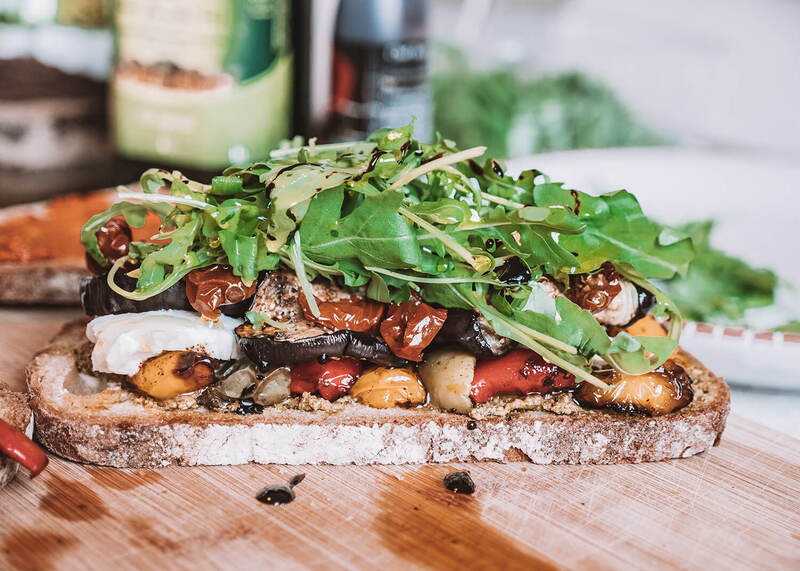 Layer on the vegetables, add the sliced mozzarella, sundried tomatoes then rocket and drizzle with a touch more olive oil and balsamic glaze. 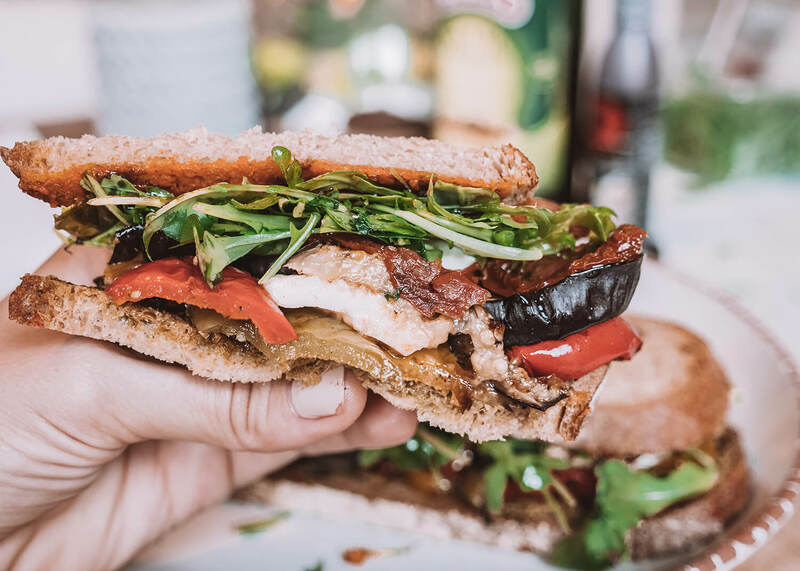 Press the sandwiches together firmly so all the juices get absorbed, then either wrap up and save for on-the-go or eat right away!